Jacobs (16-5) defeated Cary-Grove (12-12) in straight sets 25-17, 25-23 in a match Thursday, October 4, 2012 at Jacobs High School in Algonquin. Mike Greene - mgreene@shawmedia.com Jacobs' Bridget Wallenberger (left) and Maris Smith jump while attempting to defend during a match against Cary-Grove Thursday, October 4, 2012 at Jacobs High School in Algonquin. Jacobs (16-5) defeated Cary-Grove (12-12) in straight sets 25-17, 25-23. 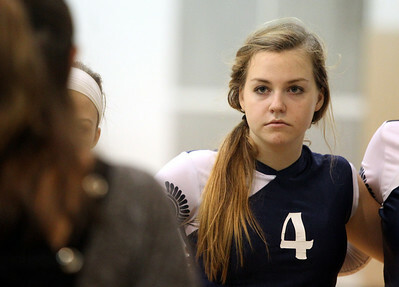 Mike Greene - mgreene@shawmedia.com Cary-Grove's Bree Coffey listens to head coach Patty Langanis during a timeout in a match against Jacobs Thursday, October 4, 2012 at Jacobs High School in Algonquin. 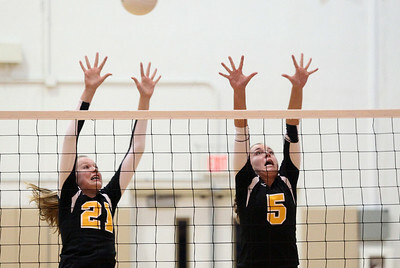 Jacobs (16-5) defeated Cary-Grove (12-12) in straight sets 25-17, 25-23. Mike Greene - mgreene@shawmedia.com Jacobs' Alyssa Ehrhardt (left) swings to spike the ball as Cary-Grove's Sam Katchen and Mallory Wilczynski attempt to defend during a match Thursday, October 4, 2012 at Jacobs High School in Algonquin. Jacobs (16-5) defeated Cary-Grove (12-12) in straight sets 25-17, 25-23. 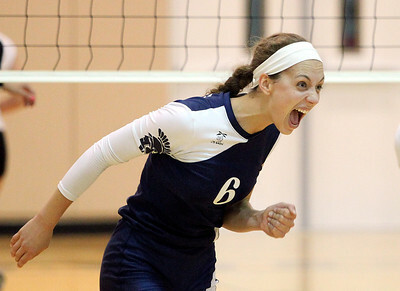 Mike Greene - mgreene@shawmedia.com Cary-Grove's Amy Jereb reacts after a point during a match against Jacobs Thursday, October 4, 2012 at Jacobs High School in Algonquin. 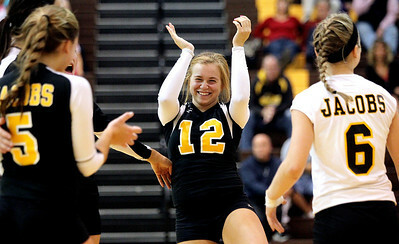 Jacobs (16-5) defeated Cary-Grove (12-12) in straight sets 25-17, 25-23. Mike Greene - mgreene@shawmedia.com Jacobs' Rachel Arceneaux prepares to spike the ball as Cary-Grove's Amy Jereb defends during a match Thursday, October 4, 2012 at Jacobs High School in Algonquin. 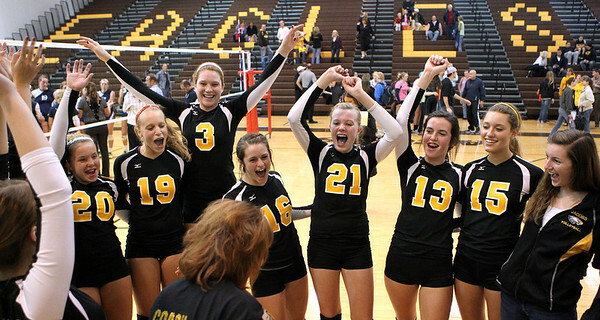 Jacobs (16-5) defeated Cary-Grove (12-12) in straight sets 25-17, 25-23. Mike Greene - mgreene@shawmedia.com Jacobs' Katie Mahoney hits the ball as Cary-Grove's Alex Larsen (left) and Morgan Lee defend during a match Thursday, October 4, 2012 at Jacobs High School in Algonquin. 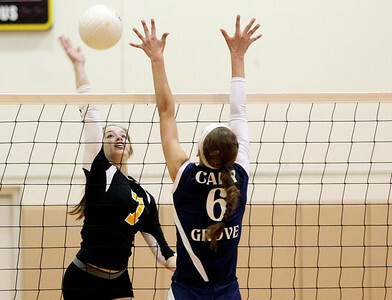 Jacobs (16-5) defeated Cary-Grove (12-12) in straight sets 25-17, 25-23. Mike Greene - mgreene@shawmedia.com Jacobs' Kassie Kasper prepare to bump a serve during a match against Cary-Grove Thursday, October 4, 2012 at Jacobs High School in Algonquin. 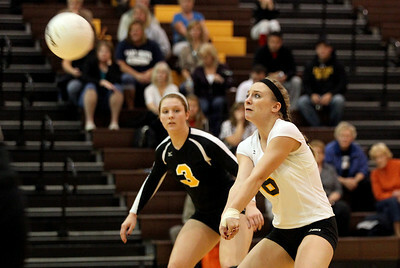 Jacobs (16-5) defeated Cary-Grove (12-12) in straight sets 25-17, 25-23. Mike Greene - mgreene@shawmedia.com Jacobs' Mackenzie Traub celebrates after scoring a point during a match against Cary-Grove Thursday, October 4, 2012 at Jacobs High School in Algonquin. 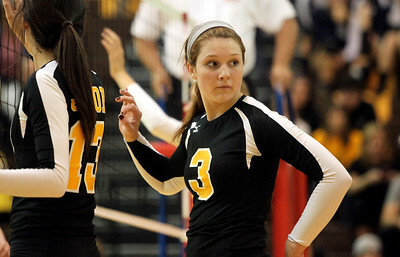 Jacobs (16-5) defeated Cary-Grove (12-12) in straight sets 25-17, 25-23. Mike Greene - mgreene@shawmedia.com Jacobs' Alyssa Ehrhardt listens to coaches while at the net during a match against Cary-Grove Thursday, October 4, 2012 at Jacobs High School in Algonquin. Jacobs (16-5) defeated Cary-Grove (12-12) in straight sets 25-17, 25-23. Mike Greene - mgreene@shawmedia.com Jacobs' players react after defeating Cary-Grove in a match Thursday, October 4, 2012 at Jacobs High School in Algonquin. Jacobs (16-5) defeated Cary-Grove (12-12) in straight sets 25-17, 25-23. Jacobs' Mackenzie Traub celebrates after scoring a point during a match against Cary-Grove Thursday, October 4, 2012 at Jacobs High School in Algonquin. 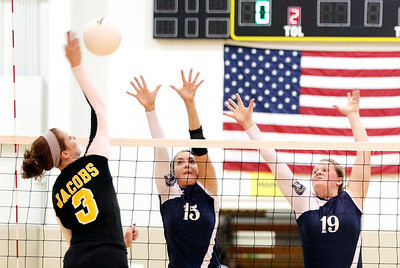 Jacobs (16-5) defeated Cary-Grove (12-12) in straight sets 25-17, 25-23.